Children under the age of 10 must be accompanied by a responsible adult, 18 years of age or older. Without a responsible adult, children under 10 will be denied admission to the pool. There is not a non-swimmer discount; all patrons entering the pool are required to pay the appropriate fee. 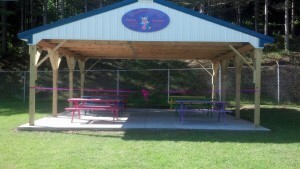 The Borough has a pavilion available for party rentals. This pavilion was donated to the Borough in memory of Catrina Williams and Carianna Kroh. List of people attending must be provided to the concession stand upon entering on the day of the event. People will not be admitted unless they are listed. We do not supply cakes. Birthday cake will be permitted to be brought to the pavilion. A vegetable and/or fruit tray is allowed but no other outside food or drink will be permitted. Additional food and drinks may be purchased at the concession stand. If you would like to rent the pavilion, please click the following link to download the rental contract. Contact the Borough Office at 570-544-2149 to verify date availability. 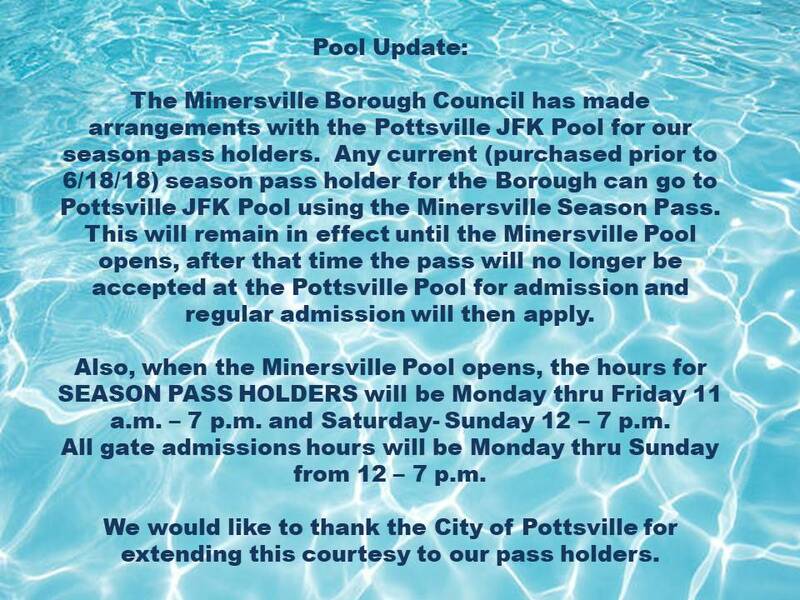 Season Tickets for Minersville Borough Pool are now available. Applications can be made at the Borough Office, 2 E Sunbury St., Minersville or by downloading online at www.minersvilleonline.com and mailing into the Borough Office. Season tickets will be available at Borough Office and Minersville Community Pool throughout the summer. All applications will be verified before tickets are issued. Fraudulent information voids pass. * A family consists of parents or couple and up to 3 children, all permanent residents of the same household and same immediate family OR 1 adult and up to 4 children. Separate pass required for any adult 18 or older residing in the household, (adult children, grandparents, aunts, uncles). Children under the age of 10 must be accompanied by a responsible adult, 18 years of age or older. Without a responsible adult, children under 10 will be denied admission to the pool. There is no non-swimmer discount; all patrons entering the pool are required to pay the appropriate fee. Registration is held at the Minersville Swimming Pool during pool hours! No phone or late registrations will be accepted!! Pool Hours Daily: 12-7 p.m.